The sad part about writing about Walt Disney World from over six hundred miles away is that I routinely miss out on covering new experiences and dining options in a timely manner. Generally, I wait a bit to talk about these new corners of the Kingdom as everything has already been said and I want to be there to give these experiences a push once the shine has worn off. 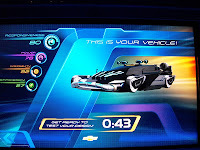 However, Test Track, which opened just over a month ago to rave reviews, deserves a little of my immediate attention for a very specific reason. That reason? I was not looking forward to this refurbishment. True, I knew the EN-V was going to show up and that was enough to entice me through the door. And yes, utilizing World of Motion’s icon everywhere, and I mean everywhere, made me flash a nostalgic smirk. I read all of the reviews that simply swooned over the new Test Track and I sat through more HD ride-through videos than I care to admit, but I simply wasn’t wowed. I wasn’t wowed, that is until I actually step inside the attraction. Let’s start with what we’ve all seen. 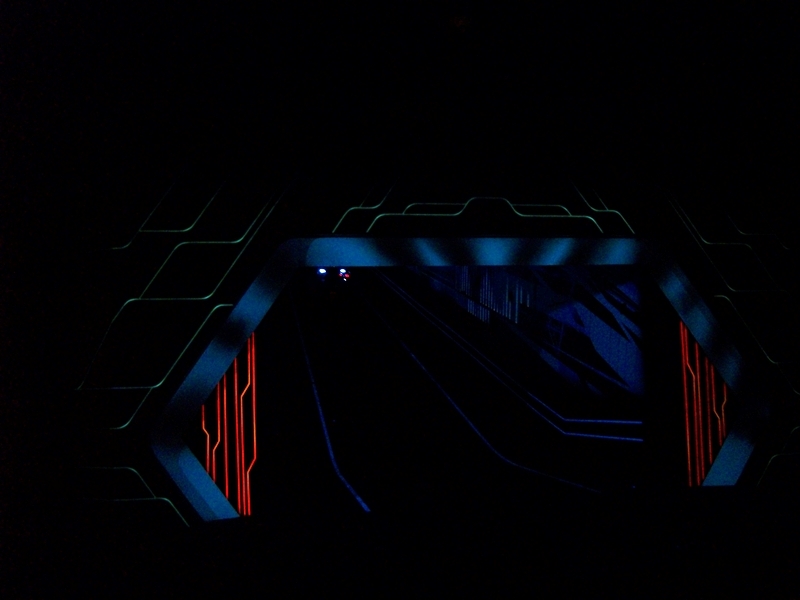 The ride itself utilizes the track layout from the original Test Track. The trees of the hairpin turns are still there, the truck arrives in the same turn, albeit with a computer generated feel, the conditions facility (hot, cold, corrosive) are still present but have a new purpose, and handling unforeseen road conditions is still in the opening. 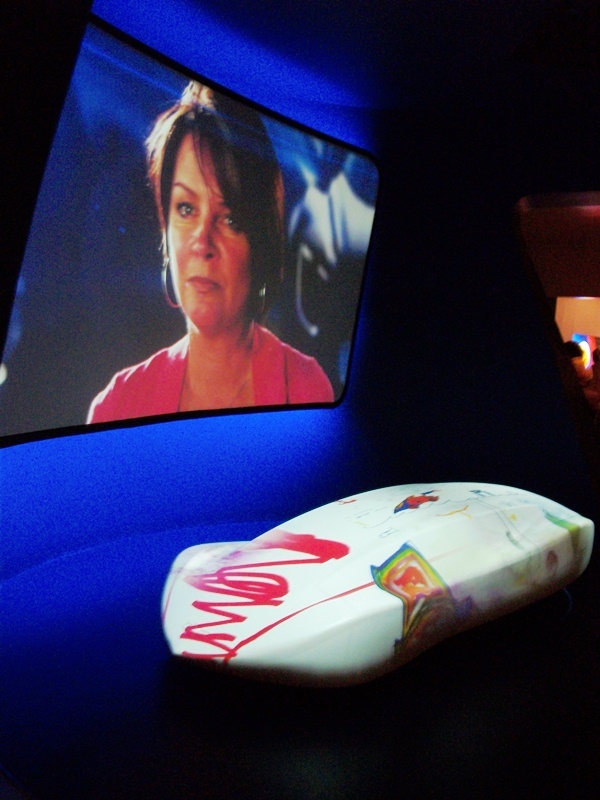 However, rather than the banter of GM staffers, the computer simulation includes your Sim Car being loaded into a computer simulation and a friendly, Siri-like narration. 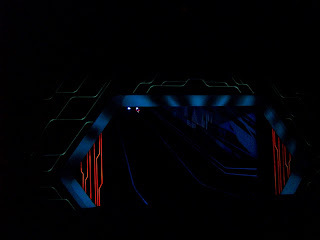 There is the nod to Progress City, U.S.A. and World of Motion, great use of the projection technology Disney has been getting so good at, and an overall composition that makes Test Track feel like you are visiting a world not unlike that of TRON, although this would be the light version of The Grid. 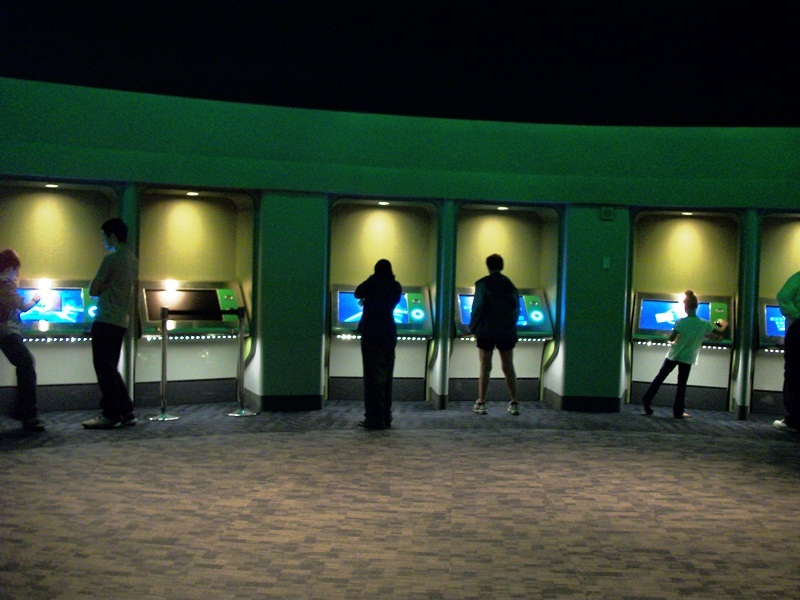 It is all clean lines, clever gags, and a bold color palate, but the look and the ride itself isn’t the reason to visit this latest version of Test Track. 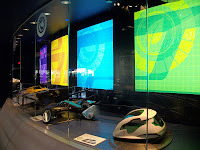 The queue starts with a display of a futuristic car model, a carving of the Test Track symbol car seen on the signage, and models featuring perfect examples of Power, Responsiveness, Efficiency, and Capability. A quick turn and you’re looking at the EN-V and an EN-V that has been pulled apart and is hanging in midair Matrix style. 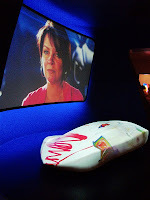 Another turn, and guests find themselves facing a video screen talking about the people and their drives for automobile creation, along with that same Test Track sleek car icon with projections of everything from childrens’ scribbles, blueprints, to flowerbeds and more. One last hallway showing guests how to handle the touchscreen displays, and then into the Design Studio to craft your own car. Designing takes a while, but once you get the hang of it you can move through a ton of aspects of design. Size of the car, the profile, wheel size and type, color and flair, engine types, and a ton of extra components that can make or break your design in a given category, are just a few of the areas you control. Remember those perfect models in the queue of Power, Capability, Efficiency, and Responsiveness? Yep, they’re back and it won’t be the last time you see them. The Design Studio allows some of that time spent in line to melt away, and believe me, you’ll wish you had more time with the design tools when the time is up! A couple of turns in another queue and you’ll be loading that car you designed onto your personal Sim Car via an RFID enabled card. Once onboard your creation is tested in the four categories of design and weighed against the designs of the others in your car. In my opinion, this is the heart of the attraction. You are invested in your design, no matter how ridiculous it looks, and can’t wait to see how it stacks up. Brothers and sister will have bragging rights, spouses will rub it in each other’s faces, wagers will be won and lost, and there will be blood and oil, but all in the name of good, clean fun. 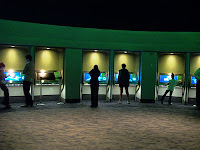 The post show area enables guests to tweak designs, race them on a projected track, take photographs with their computer generated cars, see how the rank against the day’s other designs, and visit the latest Chevrolet models in a state of the art showroom. When paired together, Test Track’s new queue and post show are as close as I have seen to EPCOT Center in character in a while and most certainly feels like the TransCenter of old. This isn’t to say that I think the newest incarnation of Test Track is perfect, it isn’t. For starters, I wish the track layout and some of the propage had been shaken up a bit, as it is far too easy to get distracted by the “In the original Test Track this is where…” mentality. 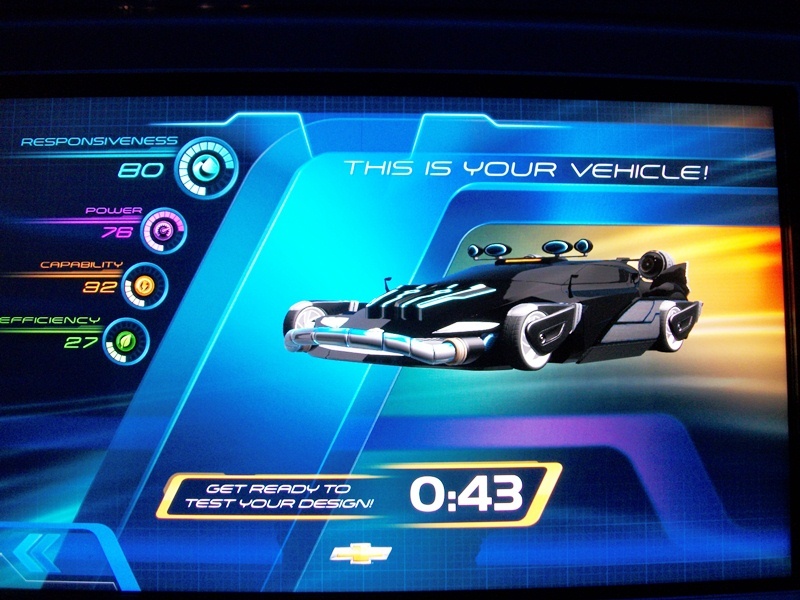 The cars, while having a flashy new color scheme, still have some problems with the onboard displays. In fact, on four of my five trips last week the screen was malfunctioning for a majority of the ride and even that one time it still glitched here and there. 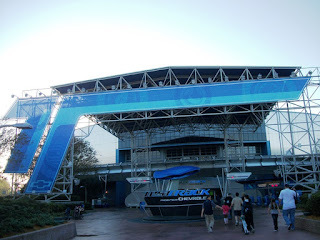 Would I go back and wait in line for Test Track again? Absolutely! I could take or leave the actual ride, but the environment that has been created in the queue and post show, and the individualization that I can infuse into my design, far outweigh any negatives I could nitpick. I hope some of you out there who are skeptical of the attraction, just as I was, will give Test Track a try, and do so with an open mind. I think it may just surprise you. Oh, and if you want a giggle, be sure to check out my Test Track design’s commercial! I can't wait to try this; it sounds like a great balance of old and new. I wonder if Disney would consider a home version of the design/race concept (or even a mobile phone tie-)to keep people involved with the attraction between vacations.